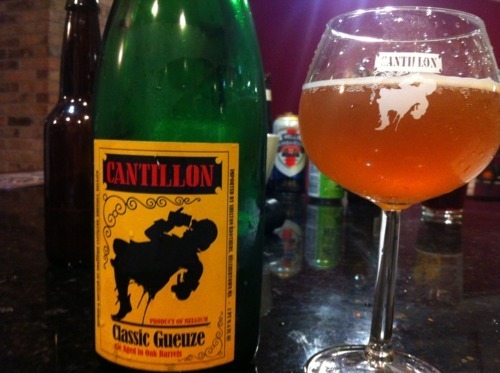 Cantillon Classic Gueuze | Drink. Blog. Repeat. Last Friday I was privy to another great night of awesome beer hosted by a new friend I met at the recent bottle share I went to. It was part clearing of the cellar, part “Hey, why don’t we try this?,” and while we didn’t get through a ton of stuff, there was one I was really surprised to see in the rotation: Cantillon’s Classic Gueuze. Cantillon is a small 112-year-old brewery in Belgium that specializes in lambics, such as gueuze and kriek. The brewery still uses the traditional spontaneous fermentation style of brewing, wherein vats of beer are left open to the elements to ferment and work their magic. While I haven’t had many of them, I love lambics. They can be very versatile – sour on their own, or with a range of fruit flavors – and a great gateway beer. But I’ve had even less experience with gueuze, a beer than blends, 1-, 2- and 3-year-old lambics together and then refermented in the bottle. The wild yeast and mild hop flavors give it more of a sour or cider characteristic not found in most beers. Classic Gueuze is, of course, a classic example of the style. At only 5%, it’s sessionable, but the unique flavors and history of the beer and brewery make you take your time and appreciate it. The pour os a hazy yellowish orange with a very light head on the top, which dissipates pretty quickly. On the nose is a very pungent funkiness, void of any of the fruit notes you’d get with a lambic. Lemon peel and citrus are the primary smells, with the funk adding a musty quality to it. The taste was like nothing I’d had before. There’s a strong sour bite right on the tip of the tongue. It mellows out mid-palate and the funk kicks in again on the back of the throat. The bitter lemon flavors are easily the most prevalent to begin with, but as you drink it there’s a saltiness that begins to develop. The bitterness sticks to the back corners of your mouth and it tastes like salt on the back of your throat, almost as if you drank salt water. It’s unique, but not off-putting, but you do have to take your time drinking it. It’s a sipper, not a gulper, and unless you have a diverse or mature palate, it will likely be a big turnoff. While nothing is set in stone yet, my fiancée and I are planning to spend our honeymoon in Belgium. Other than drinking with monks and enjoying some fresh Westvleteren 12 were already on the list, but a visit to Cantillon and their Gueuze Museum is now in the cards as well.